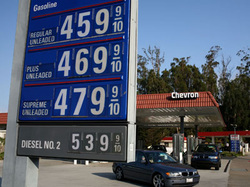 Why is Diesel Fuel More Expensive Than Gasoline Now? Historically, diesel fuel has always been the cheaper fuel type when compared to gasoline. It was not until recent years that diesel has become more expensive, and is now at least 70 cents per gallon more expensive on average. This page will attempt to answer why this has happened, and what the future holds for motorists and large transportation firms. The majority of large transportation vehicles require the use of diesel fuel, such as semi trucks, trains, and barges. These large vehicles often transport goods a long distance and have a direct relation to the economy. The better the economy is, the more transportation and sale of goods from one place to another; ie: more diesel burning vehicles creating pollution. This has led the federal government to believe that since these large vehicles have a higher representation than gasoline vehicles, they must be creating more overall pollution than gasoline engines. Because of the amount of vehicles that utilize diesel, diesel fuel should have a higher fuel tax, because they are potentially polluting more and causing more damage to roads/highways. Gasoline currently has an 18 cent federal tax per gallon, where as diesel currently has a 24 cent tax per gallon, partially contributing to higher prices. European auto makers have been promoting diesel passenger vehicles as being much more efficient on fuel, and less taxing on the environment for a number of years now. Which has resulted in a nearly 50% increase in the amount of diesel powered vehicles being driven on that side of the world. Which has in turn, forced European oil refineries to stop exporting as much diesel to North America, because of the increased demand in their region of the world. This has left North American Refineries primarily responsible for demand of diesel fuel in North America, resulting in a "limited" supply. Following supply and demand theories, diesel fuel has become a precious commodity, that can keep oil companies very profitable. Another reason stated for rising diesel costs is the Federal mandate that Ultra Low Sulfur Diesel (ULSD) become the only diesel fuel allowed in vehicles which could potentially use the highway. Originally diesel was considered to be low sulfur, which required less refining, but since U.S. laws have required ULSD, extra refining has become the norm. This extra refining to produce the low sulfur diesel has required advanced technology, and new equipment, which ultimately gets passed from the oil companies to the consumer. There are many sides to this debate: do we drill in areas we know there are lots of oil, but have been sanctioned off as wildlife refuges, do we invest money to find alternate methods of fueling our vehicles, or trade our goods produced in America to countries who are oil rich. It is difficult to be optimistic about fuel prices when there is very little relief in sight. As long as gasoline and diesel fuels are used in consumer and commercial vehicles, fuel prices will continue to dictate the economy. My family has always owned large consumer diesel trucks because of the kinds of activities we do. These activities require a large vehicle with lots of power and towing capacity, our hobbies include "RV-ing", towing a boat, and transporting our horses. It was not until recent years that diesel became significantly more expensive and ultimately forced us to do less of these leisurely activities. Less travel by my family potentially means less money being spent in places other than my hometown, less tourism. Less tourism in some towns hurts them very much because their economy potentially relies on tourism and how much people spend while they vacation there. We still go on family trips to the same places, but just not as often, primarily because of rising fuel costs. If fuel costs are my reason for less travel, then surely others are experiencing similar situations and it is all adding up to decreased spending in this struggling economy.